This is as close to a definition or translation that I can manage. The garam here refers to the intensity and not the capsaicin content – in fact it generally contains little or no chillies. It is not fiery and won’t burn your tongue or throat. I have a feeling that the usage of garam in the name originated from Ayurveda which considers spices like cloves, pepper, cinnamon and cardamom (central ingredients of Garam Masala) warm spices, i.e. those that increase the internal temperature of the body. I’ll be honest. I often use store-bought garam masala, simply because it is so easily available at every neighbourhood store. 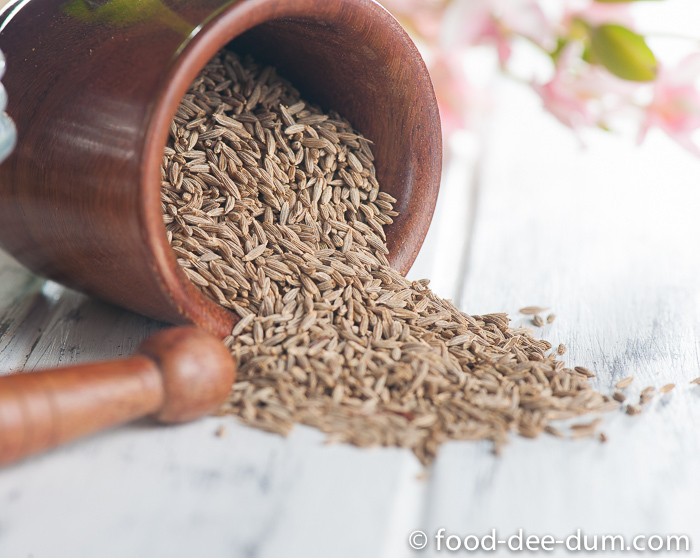 But you can be rest assured that a fresh, home-made version will always be more fragrant and more intense than any generic store-bought variety. 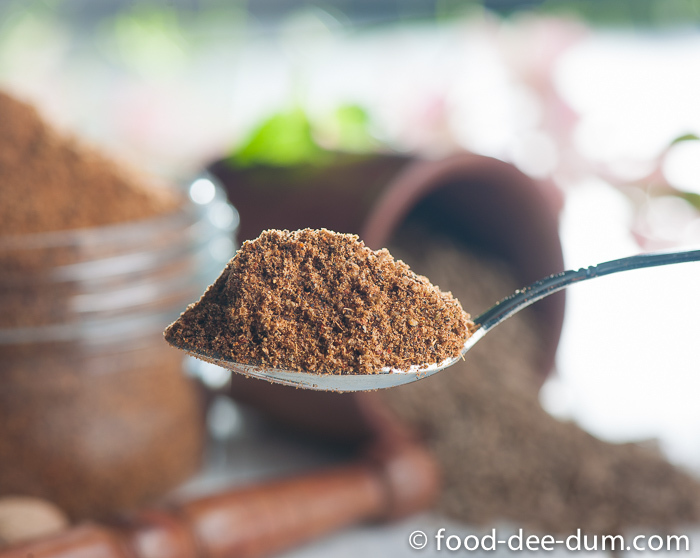 Many people even make the masala powder as required, for one recipe of curry or vegetables. I obviously lack the patience to make a fresh batch for every teaspoon that I require, so once in a while I make a larger batch and it stores beautifully in an airtight container for almost 5-6 months. I dish out a little at a time into my smaller counter-top spice box and use it as required. It has been on my to-do list for the blog for a very long time but I was prompted to fast forward my plans by a simple request from my cousin Gautam. He lives in Washington DC and does a fair amount of Indian cooking and, consequently, hordes a lot of Indian spice mixes. Recently, he visit a brand new French-Japanese fusion restaurant in his neighbourhood (Petworth) called Crane & Turtle. One of the dishes he ordered happened to use garam masala as the main flavouring ingredient. Seated at the counter right next to the open kitchen, Gautam was chatting with the kitchen staff and, to his surprise, learned that the restaurant still relied on garam masala bought from India rather than making their own — considering that they are the kind of place that makes everything from scratch! So he instantly volunteered to arrange for an “authentic, home-made” version and wrote to me, asking if I would oblige (even though he makes his own version too)! I readily agreed, specially since it was already on the list. While I sat down to put my thoughts together on the very intense subject of garam masala, I tried to remember the impression that non-Indians have given me about this spice mix — I have often heard them refer to garam masala as a generic Indian masala, something that works for any and all Indian curries. 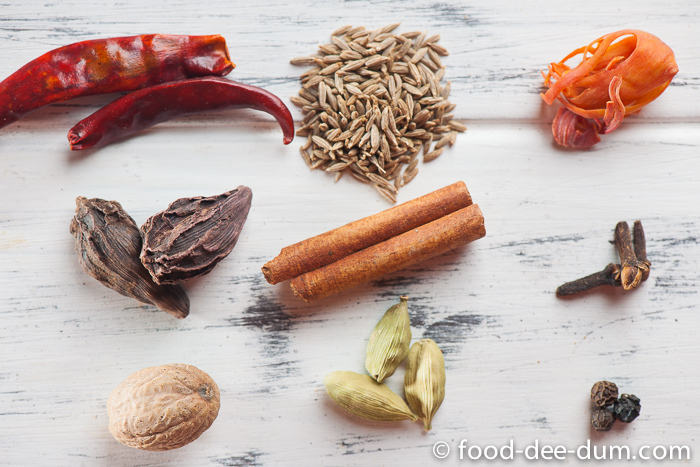 Many think that simply adding a dash garam masala can lend an unmistakable Indian flavour to any dish. 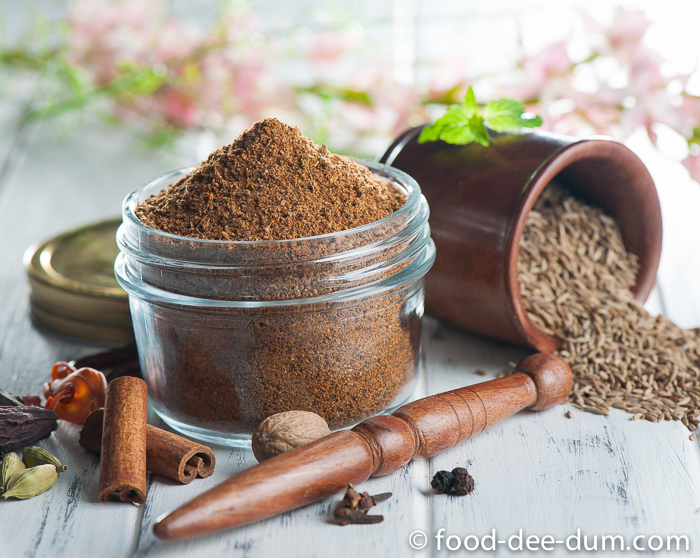 The truth is that, even though garam masala is used for a very large portion of North Indian and Punjabi recipes, there are also very many other spice blends – store-bought or home made – that are used for different kinds of preparations and garam masala is merely one of them. For example, Biryani Masala, Tandoori Masala, Chholey Masala, Rajmah Masala, Pav Bhaji Masala, Chicken Masala, Meat Masala are just a few — each is used to prepare a different kind of dish. 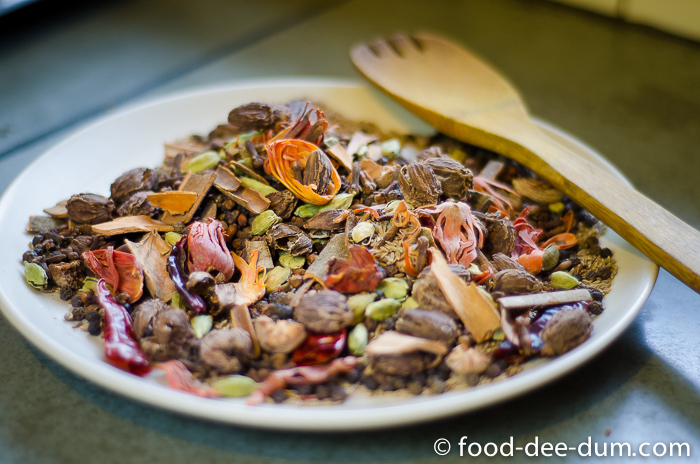 The permutations and combinations are endless and no one type of spice mix can be common to different preparations. In fact, even garam masala is made very differently in different homes and I don’t think that there is one “authentic”, accepted version. Cloves, pepper, cinnamon and cardamom are almost always present but other spices could include one or more of the following: cumin, coriander seeds, star anise, nutmeg, mace, saffron, bay leaf or any other. The version that I am sharing here is the one that I learned from my mom — I never felt the need to change or improve upon it. But you can experiment with different ingredients and proportions to find the perfect blend for you! While we are on the subject of being subjective (pun intended), I should mention that masala, in fact, is another very generic term — it could refer to whole spices, or a spice mix powder or even a paste of all/some of the following: onions, tomatoes, ginger, garlic, green chillies, coconut, tamarind, whole spices, powdered spices, spice mixes. What differs is the application – whole spices would probably be used right at the beginning to temper the oil/fat before adding other ingredients; a paste or finely chopped type masala would form the base of a curry; and powdered spices would be used either as marination ingredients or added as flavouring agents towards the end of the (masala) paste frying/ roasting stage so as not to burn the delicate powdered spices and bring about bitterness in the dish. 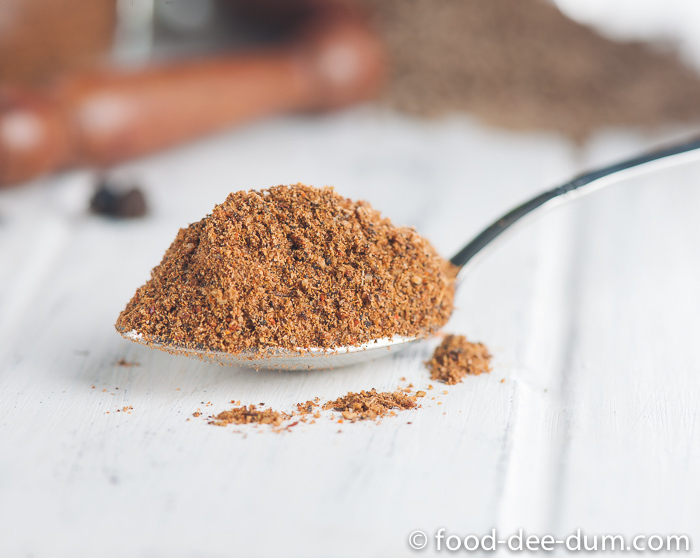 However you choose to make your garam masala, you can be assured that it will be your unique composition to suit your own personal taste. The only one factor that will remain constant and common for all kinds (and I know I am repeating myself) is the superior aroma and flavour of home-made masala. I can’t help but reiterate this because it’s the main reason that I take the trouble to make my own! I prepped the larger ingredients to make them more manageable while toasting — broke the cinnamon and nutmeg into smaller pieces using a pestle, broke the red chillies with my hand and opened up the cardamom pods by bashing them lightly with the pestle as well. I gently toasted all the ingredients, individually, in a large skillet on low heat just until fragrant, about 1-2 minute each. (Different spices will take a different amount of time due to the varying size and quantity of each). The low temperature is important to avoid burning and consequent bitterness. Keep a hawk’s eye on the spices while toasting and stir as necessary. Allowing all of them to cool completely, I ground them to a coarse powder in my grinder. If you don’t allow the spices to cool completely, they will clump up while processing. Now you can make this as fine or as coarse as you please. I like to leave it just short of the very fine powder phase, with a very little bit of texture. This can be stored easily in an airtight jar or container for 5-6 months, spooning as much as you need into a smaller jar/ spice box (like me). Or you can even make a proportionately smaller batch to finish it faster! The average store-bought packet of Indian masala powder is usually about a 100 gms — so halving this recipe should make a usable quantity. There is no right or wrong way with this masala and there are many interpretations and variations. Aside from a different list of ingredients, I am sharing some other variations in process that I have heard of or read about. The whole spices can be toasted or used as is. The flavours of the two types differ, obviously, but I like toasting because it releases the aroma and the flavour seems a little richer too. 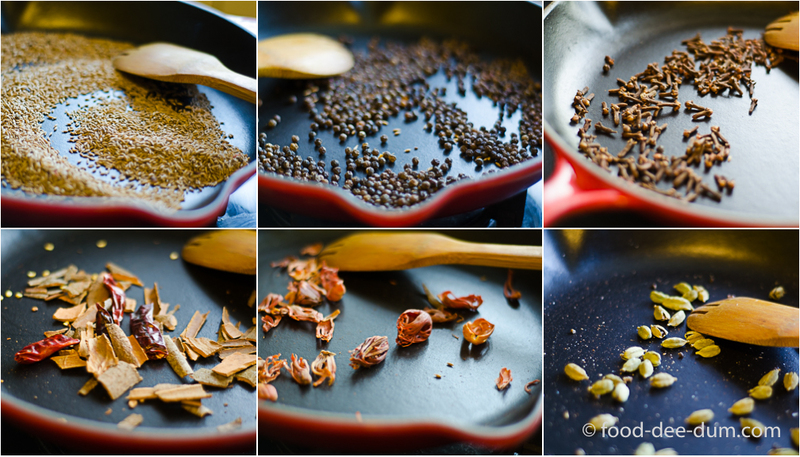 Some people also prefer to sun the whole spices for 2-3 days instead of stove-top toasting. I find that the stove-top method allows you a little more control. And, of course, it’s faster. Some people like to discard the cardamom pods and keep only the seeds. I prefer to keep the pods too — just bash them a bit to let the seeds out so that they, too, can benefit from the toasting. When the pods are in the mix, the powder will never be super-fine, but that doesn’t bother me.